Originally posted at Blissful Kids, December 2008. 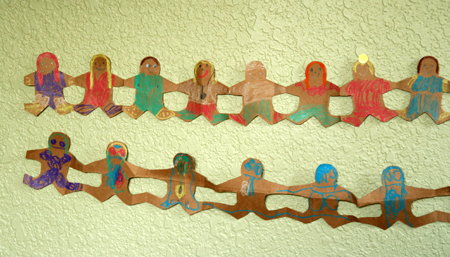 With just a brown grocery bag and some crayons, you and your kids can create this sweet garland of paper-doll-style gingerbread boys & girls. With some good scissors, cut around the shape (this is a grown-up job!). Remember not to cut any parts that are on the folded sides, in this case the ends of the arms and legs. 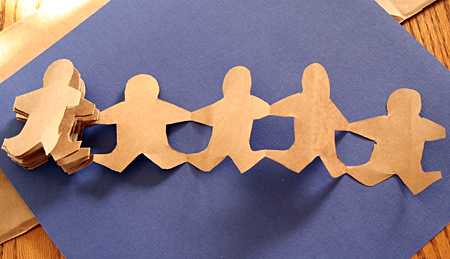 Unfold and see the long string of gingerbread people holding hands! Let your kids get busy decorating! 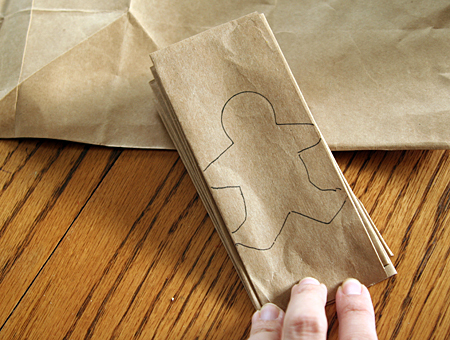 We used crayons, but the paper bag would be sturdy enough for paint, or even fabric scraps, ribbon, ric-rac, etc. I did this a couple of years ago. I used fabric paint to “frost” ours. Thanks for sharing this cute picture and link. Another BRILLIANT idea. Paper grocery papers are nearly non existent here in Europe. Hmmmm, I’ll have to have a look around to see if I can find a substitution.